Armenian Orthodox Church seeks eight pages of the Zeyt'un Gospels that the Getty Museum bought in 1994. The Getty asked the motion to be dismissed, but judge orders mediation. The J. Paul Getty Trust failed Thursday to derail a lawsuit by the Armenian Orthodox Church that accuses the museum of harboring stolen illuminated medieval manuscripts — 755-year-old works that are masterpieces and, to the church, spiritually and historically sacred. After a brief hearing, Los Angeles Superior Court Judge Abraham Khan denied the Getty's motion to dismiss the claim. The museum's attorneys argued that the deadline for filing the suit had passed decades ago under the statute of limitations. But the judge said that's "not clear" and ordered four months of mediation, scheduling a March 2 resumption if the case isn't settled. At that point, the judge said, he might focus on the complicated history of the pages' journey from the Turkish region of Cilicia to America during and after the World War I-era Armenian genocide, in order to determine whether the suit filed last year meets the six-year statute of limitations. The West Coast branch of the Armenian Apostolic Church of America — acting on behalf of its mother church, the Lebanon-based Holy See of Cilicia — hopes to recover the eight folded pieces of painted parchment that once formed the front pages of a larger work called the Zeyt'un Gospels. The Getty Museum bought the pages in 1994 for $950,000. The church wants to send them to a museum in Yerevan, capital of the Republic of Armenia, so they can be reunited with the rest of the Zeyt'un Gospels, housed there since the 1960s. Though disappointed with the ruling, the Getty said in a statement, "we are confident that we hold legal title." Lee Boyd, heading the church's legal team, said after the hearing that the Getty failed to investigate the pages' provenance — or ownership history — when it bought them from Armenian American heirs of a man the church says stole the pages in 1916. The Zeyt'un Gospels briefly had fallen into his hands amid the upheaval of the Turks' expulsion of the Armenian community from Cilicia, then a region of the Ottoman Empire and now part of Turkey. Boyd said that the Getty also failed in 1994 to consult with officials of the Matenadaran, the museum in Armenia whose collection includes the rest of the Bible created in 1256 by T'oros Roslin, whom the Getty's website describes as "the most accomplished master of Armenian manuscript illumination." The head of a leading manuscript archive said this week that instead of falling back on legal arguments, the Getty should be addressing ethical issues — and conclude that returning the pages would be proper. Father Columba Stewart, a Benedictine monk and executive director of the Hill Museum & Manuscript Library at St. John's University in Collegeville, Minn., said that a whole work of art is better than a divided one, and that when a museum has the power to turn a fragmented manuscript into a complete one, it should do so. "It's better from an artistic perspective … it can [then] be studied by scholars as a whole object," said Stewart, whose museum is creating a comprehensive digital archive of Christian manuscripts from around the world, and last month won the National Medal for Museum and Library Service — the federal government's highest award in the field. Acquiring individual sheets of a manuscript is improper, he said, unless the original work already is so fragmented or scattered that there's little chance it can be made whole. Museums must avoid "contributing to an improper fragmentation of a work. In this instance, it would not be a terribly complex matter to restore the whole." Beyond that, Stewart said, the Getty, which in recent years repatriated more than 40 artifacts to Greece and Italy after evidence showed they had been looted from archaeological sites, should consider that these works are still venerated: "Here's a living, breathing religious community, as opposed to classical antiquities." Responding in writing to Stewart's criticisms, Elizabeth Morrison, the Getty's acting senior curator of manuscripts, said that "well-regarded … collections around the world" contain individual manuscript sheets. "The Getty in no way condones the practice of taking apart manuscripts, but we continue to collect individual leaves after careful examination proves that they have not recently been removed … with motives of financial gain." The Republic of Armenia and the government-run Matenadaran are not parties to the dispute, although the museum's director, Hrachya Tamrazyan, last year sent a letter to church attorneys, confirming that "we have asked you to represent … the interest of the Republic of Armenia … including the Matenadaran, using your best efforts to obtain the return of these treasures … to their rightful owners." In an interview Wednesday, Grigor Hovhannissian, the Armenian consul general in Los Angeles, said that the museum director was speaking for himself, not the government, which is taking "a wait and see position.... There are issues we need to understand better." Hovhannissian said this is the first cultural patrimony case to have emerged since Armenia became an independent nation 20 years ago. The case has been reported in the Armenian media, he said, and "there's quite a bit of emotion, an emotionally charged atmosphere when talking about this piece of art." Vartkes Yeghiayan, an attorney for the church, said that its legal team has identified at least 60 other Armenian manuscripts in American collections — at Yale, Harvard and the Walters Art Museum in Baltimore, among others — that may have been stolen. Further suits may result, he said, if church authorities give the go-ahead. 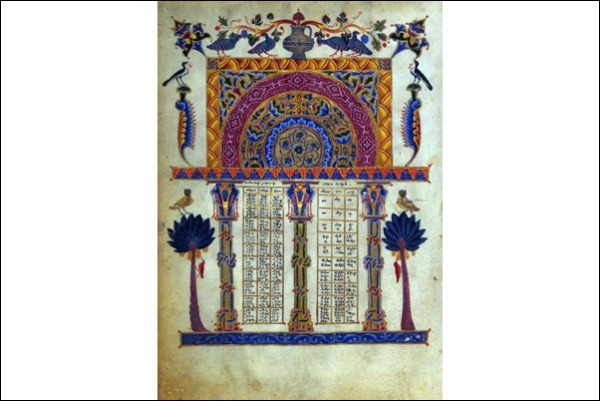 The suit against the Getty says that before the Armenian genocide, the Zeyt'un Gospels resided at a church in Cilicia, where the work was venerated and believed to possess holy powers that would protect the community in times of war. In 1915, as Armenians in Turkey were being killed or expelled, the suit says, the Bible was paraded through the streets "to create a divine firewall of protection around the city." It began to change hands for safekeeping, and in 1916, the suit says, the disputed sheets were removed, resurfacing with an Armenian American immigrant family in Massachusetts that sold them to the Getty. The pages emerged in 1994 as an anonymous loan from the family to an exhibition at the Pierpont Morgan Library in New York City, which traveled to the Walters Art Museum, where a critic for the Baltimore Sun described the Zeyt'un pages as a "tour de force … with their elaborate trees, scrolls, cornucopias, columns, vases and pitchers, and no fewer than 26 pairs of birds wearing brilliant plumage." The Getty bought them at that time — a period when it was also acquiring antiquities despite clear evidence they had been recently looted. Under California law, suits to recover allegedly stolen artworks from a museum or art dealer must be filed no later than six years after the owner learns of their whereabouts. The Getty contends that articles published in 1943 and 1952 prove that the church knew that the Massachusetts family had the pages and should have sued for their return back then. Boyd, the church's lawyer, disputed that, adding that the Getty is ignoring the historical reality then facing the Holy See of Cilicia, which ministers to Armenian Orthodox adherents in North America and the eastern Mediterranean. As church leaders tried to help persecuted refugees rebuild shattered lives, she said, "cultural objects were the last thing on their mind."